Kadim (second right) exchanging the signed MoU with Kenji, witnessed by Johari (right) and Shinya (left). KOTA SAMARAHAN: Universiti Malaysia Sarawak (Unimas) yesterday signed a Memorandum of Understanding (MoU) with Kuramae Services Sdn Bhd (Kuramae) to strengthen collaboration between the two organisations through the sharing of expertise, experience and talents in information communication technology (ICT). Its vice-chancellor Prof Dato’ Dr Mohamad Kadim Suaidi said the university has long seen the advantages of ICT and has formalised the recognition by positioning ICT as one of its three niche areas. “With this partnership with Kuramae, a product of a joint collaboration between Gigaspeed Technology Sdn Bhd specialising in network infrastructure design and implementation, Phoenisys Co. Ltd, Japan, which specialises in IT Business Design and System Solution Partner, and Next Intelligence, a Knowledge Management implementation partner, we hope experts in both organisations will share ideas and experiences and thus contribute to the advancement of ICT industry in Sarawak. “The signing of the MoU will provide both Unimas and Kuramae opportunities to work more closely toward the pursuit of excellence in Teaching & Learning activities through students’ intership programme, industry speaker series, final year project supervision, research and innovation and also services,” he said prior to the MoU signing ceremony held at the university here yesterday. Kadim also noted that Unimas’ ICT curriculum is benchmarked against the Association of Computing Machinery (ACM) standard with its graduates proven to be highly sought after in the job market each year. “For example, the Graduate Employability percentage of our Computer Science graduates last year yields at 80 per cent, measured from the time they completed their study in July to the graduation ceremony in November. “As such, we are confident that we will be able to provide highly competent graduates, which can contribute to Kuramae’s growth and many other ICT industry players not only in Sarawak and Malaysia but also globally,” he said. 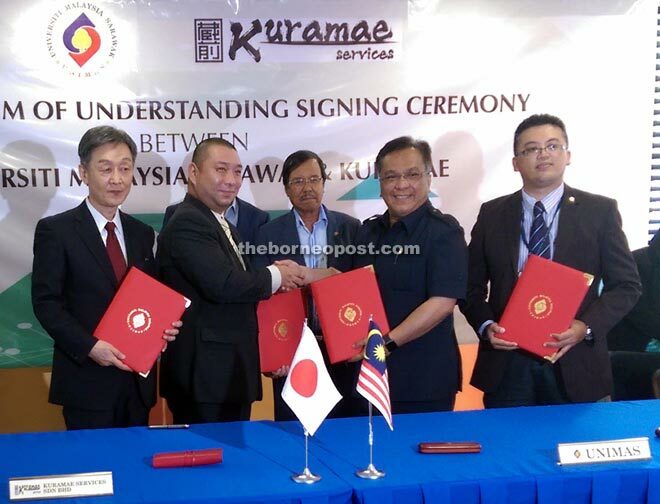 Meanwhile, Kuramae president Kenji Kinochi expressed his confidence that the collaboration between the university and the Japanese company will contribute global talent and technology development for the future of both Malaysians and Japanese. Kadim and Kenji signed the MoU which was witnessed by Unimas Faculty of Computer Science and Information Technology dean Dr Johari Abdullah and Kuramae corporate management advisor Shinya Asahara.